This post contains affiliate links. I will receive a small commission if you make a purchase. Thanks! But after a footman and a new maid are seen kissing under the bough and then turn up dead afterwards, the downstairs staff is convinced a serial killer is among them…perhaps the mysterious guest known only as J. Mortimer. When Madeline’s baby disappears, Cecily desperately tries to find the child. If she doesn’t catch this killer in time, everyone’s cheer will quickly turn to fear. This Christmas mystery has all of the elements a cozy should have. It is a very cute book that leaves you wanting to read more about the characters. If you read a cozy expecting it to not be fluffy, you are reading the wrong genre! It is meant to be fluffy and cozy and not deep. People who criticize cozies for these reasons must not know that that’s what cozies are. Mistletoe and Mayhem is set in the southeastern coast of England in the Pennyfoot Country Club. The curse upon the Pennyfoot awakens and dead bodies start turning up left and right. Of course, this would never happen in real life, just like Jessica Fletcher would never have as many murders happen around her as she does. That is the joy of reading. You leave reality behind and just pretend that it could happen. We would miss the characters if the murders happened elsewhere! I really enjoyed the characters in this book. The cameo appearance was great 🙂 (I did figure out who it was right away but it was still cute. )I really loved the twins bugging everyone. The murderer was not immediately obvious, so that was nice. 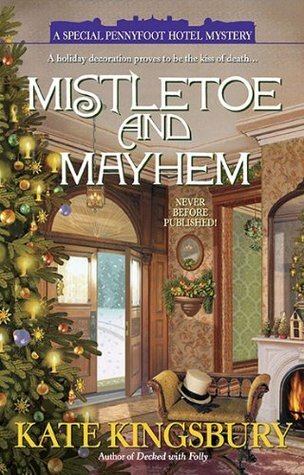 If you like cozies, you should read Mistletoe and Mayhem! I like that you gave this book your own rating…I don’t read, but this one sounds scary!! Sounds like a good read. You gave a great review. Thanks, Melissa! It is really cute!